Designer Nicholas Belly won second prize in L'ARGUS design competition with his flatpack bike and scooter. I think I'll categorize this innovation up there with the disposal mobile phone, remember that one? That said, Wooden bicycles have been produced for centuries, going back to the very invention of the bicycle itself. In recent times, DIY culture has spawned a brace of wooden bike designs that you can make yourself. These hybird structures are basterdised bicyles morphed with timber. The bikes can be seen at http://www.woodenbikes.com/ and include some classics such as the Rear Captain Tandem shown above. What this does interest me in is the history of wooden bicycles which goes back to war times when steel was in limited supply. Recently spotted on the Antique Roadshow was this Wooden bicycle shown below. This bicycle was built during the war by two brothers. One of the brothers used his skills as a ski manufacturer on this new type of bike. As well as saving on steel, these bicycles were lighter and faster than the older models. The owner has never seen another complete bicycle. Going back to the invention of the bicycle itself, the Celerifere or Velocifere was invented by Frenchman - Comte Mede de Sivrac. The celerifere had a wooden frame and wheels, and no steering apparatus. It was manually propelled by the feet like a balance bike. 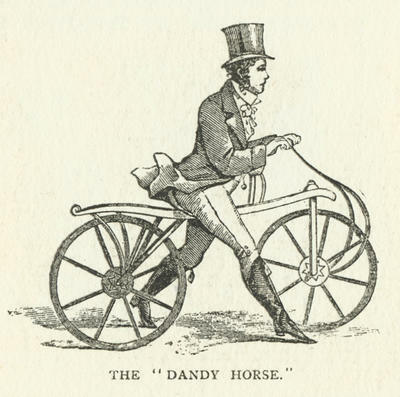 Introduced to Britain, they became known as "hobby horses" or "dandy horses", the latter name referring to the fact that few people other than young dandies were willing to ride them (or could afford the high price of purchasing one!). And for that Friday feeling, please listen. Below is a chanson that I came across called Le Vélo. The chanteur is infact a guy from Dublin who just likes to write and sing songs in French! It's a classic.